In an essay in Sports Illustrated, Lebron James announced his decision to return to the Cleveland Cavaliers. Miami is always the bad guy. People love to hate us. We’ve been called everything from a ‘Paradise Lost’ to a banana republic and everyone, from politicians to sports commentators can barely hide their disdain for our city or our sports franchises. Never was this more evident than when Lebron James left Cleveland to join the Miami Heat in search of NBA championships. The criticism was endless. And although Cavaliers’ fans burned his jersey and called him a traitor, although the team’s owner derided him on the team’s official website until just two weeks ago, despite the insults and the boos, it was Lebron and Miami that became the NBA villains. The Miami Heat became the team that everyone loved to hate. And why? Because a young man wanted to pursue opportunities that he didn’t have at home? Because he was ambitious? Because he wanted to grow and develop his talent? Because he wanted to win? Well, we welcomed him. And he did flourish as a player and as a leader, and he won and he shared the spotlight with Dwayne Wade and Chris Bosh and an entire team that he propelled to two NBA Championships, and while the sports commentators grumbled, we celebrated. In four years, the Miami Heat won two NBA Championships. Thanks, not only to Lebron James, but to the dedication of the team. 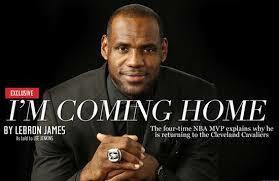 So isn’t it wonderfully ironic that when Lebron James announced that he was leaving us, Miami did not implode. There weren’t mass demonstrations, jerseys burning in trash cans. No one called him a coward. Instead, overwhelmingly, he was met with gratitude. Mickey Arison wished him well. The Miami Heat thanked him for the memories. We are disappointed. We wish he had chosen to stay. We know that our team will struggle without him. But, we understand, because people have called us all kinds of names: obnoxious, vain, fair weather fans, superficial, narcissistic. We are a young city and maybe we carry a lot of the swagger and exaggerated bravado that comes with youth. Do we like to win? Of course, who doesn’t? Do we celebrate big? Yes. Are there fickle fans? Yes, and so do many other cities. And, are we suckers for glitz, glamour and excess? Sure. But that doesn’t make us villains. We also know what it is to move to build and to prove ourselves. We are a new city, constantly proving ourselves. We are a city made up primarily of immigrants, who know what it is to leave home to chase a dream or pursue greater opportunities. We know what it’s like to be called selfish for that. And like Lebron James, we understand how it feels to long for home. As James returns home, I know that Miami will miss him. He is a phenomenal athlete, maybe even the best to ever play the game, and we are happy that he brought his talent here. 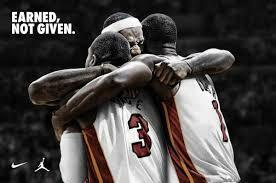 But, I also know that the Miami Heat will regroup, recover and rebuild, because that is what we do. ← Life on the Hyphen: American or Miamian? Very well said! I share all those sentiments. The only thing I will add is disappointment in Lebron for not warning his ‘brother’ Dwyane Wade to hold off on opting out of his contract in the belief he would return and they could get new talent. He lost out on millions and Miami also lost out on some good talent because he waited til the last minute to drop the bomb. If it truly was about going home, he had to know a lot sooner. I think it was a combination of things, one of which was about his new found power over the NBA…everyone was ‘waiting’ on him to decide what to do. That’s a powerful feeling and powerful position to be in. Kudos to you Neyda! !